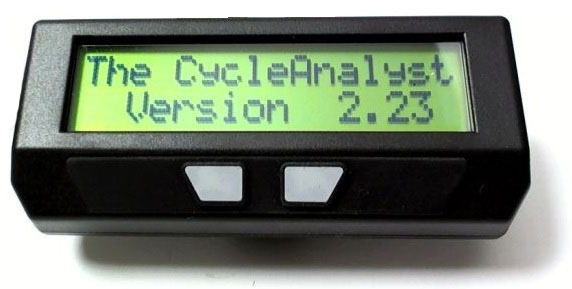 The Cycle Analyst (formerly called DrainBrain) is the first digital dashboard and battery monitor originally designed around the specific needs of electric bicycles. However, the flexible setup configurations, wide feature range, and affordable price have led it to widespread appeal in a range of other EV applications. From the dashboards of MIT's solar car, to record breaking electric motorbikes, to small trains, powered wheelchairs, and even sailboats and airplanes, the Cycle Analyst has become the e-meter of choice for keeping track of the vehicle's battery usage and performance characteristics. Get instant readout of speed, Amps, Watts, voltage and more. New model has a variety of new feaures including Data Logging: Devices have a serial output stream that can be used for real-time recording the vehicle statistics to a computer or laptop (see manual). Voltage: 10-150V standard for Rev11 PCB (15V - 100V for Rev10 and earlier). Current Accuracy: Temperature coefficient and accuracy depend on the shunt and calibration. With the pre-calibrated Stand-Alone model, it is within 2% +- 0.04A. Wheel Size: There are no restrictions on the allowable wheel circumference within the range of 0 to 9999 mm. Distance: Trip distance is capped at 1999 km or miles. Odometer distance rolls over after 99,999 km or mi. Amp-Hours and Watt Hours: Both forwards and negative amp-hours are limited to 1999 Ah per trip in low range mode, or 19999 Ah in high range mode. The trip watt-hours can go up to 19999 Wh in low range mode, and 199999 Wh in high range.